Residents of De William, West Coast Demerara and the surrounding villages were sent into panic and flood preparation mode at around 5:00 pm yesterday after the door of the koker connected to the ocean, was destroyed by the strong Atlantic current. 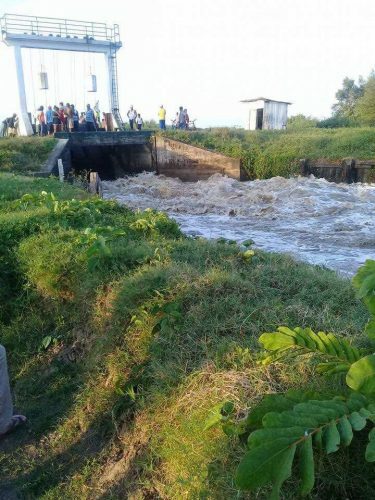 When Stabroek News visited the area, hundreds of residents from the surrounding villages were gathered at the scene, as thousands of gallons of water gushed in from the Atlantic Ocean. Speaking to this newspaper at the scene, Yudhistir Mana, Uitvlugt Estate Manager, confirmed that the sluiced is manned and managed by GuySuCo. 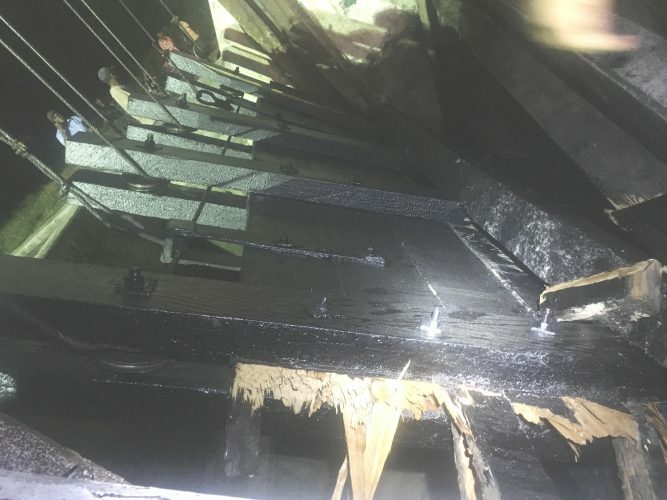 He explained that around 5 pm, he received a call reporting that the sluice door had collapsed, as a result, of the continuous pressure exerted by the ocean. “There is nothing we could’ve done to the door to secure the water from coming into the system,” he said, while explaining that from the moment they received the report they put measures in place to procure material to construct a “false door” to inhibit the inflow of the water. “It is expected that by 9:30pm we should have a balance in the water, and thereafter, we will install the false door. The water would’ve started dropping since 5:00pm, but we expect it will be much lower and the water pressure will also be less,” Mana said. When questioned on what could have caused the door to collapse under the pressure of the water, as compared to the other sluice doors along the West Coast, Mana explained that since the sluice is situated in “the mid of the Atlantic ocean, and there are no barriers, so, it felt the full brunt of the water pressure because everything is pretty new,” whilst noting that there is no contention about whether the door was sound enough. He also added that while there has been no indication of the tide being exceptionally high, the water current has been “rougher” and explained that it could be a spin-off from Hurricane Irma which is presently moving through the Caribbean. As a result of the incident, which he observed was beyond the control of the sugar company, Mana said that they will now be paying more attention to the sluices that are maintained by the company, and special measures will be put in place to ensure that this isolated incident is not repeated at other sluices along the coast. However, even though Mana assured that there would be no flooding in the nearby communities since the water had already started dropping, some residents explained that they have already prepared for a possible flood, while some others said that they were planning to. 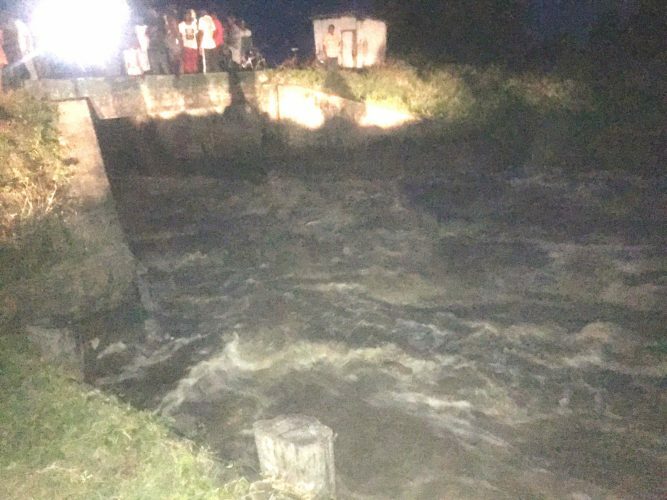 “Nothing we could do now but wait,” said Randy Singh, who explained to Stabroek News last night that as soon as he heard about the breach in the koker he rushed to the scene. “I just see the water bussing through the koker door that deh halfway in the water. It just coming and coming and coming, and it not stopping. So I run home and start moving things off me ground cause I don’t know what gonna happen by tonight,” Singh added. “I never see the water bruk up a door like that in me life, and I deh around these things long, long. Plus watch at how the water rushing in, the tide strong, strong,” another elder resident explained. One man, who was at the sluice when it broke, explained that he just heard a loud cracking sound before the sluice slammed into the concrete base. “After it slam and crash, you just hear the water rushing through,” he said. Despite the tragedy, residents said they were surprised at how fast GuySuCo responded. The sluice gate reportedly broke around 5:00 pm, and by 7:00 pm, one hydraulic lighting tower, two tractors, wood and other equipment were already in place for the construction and installation of the false door. 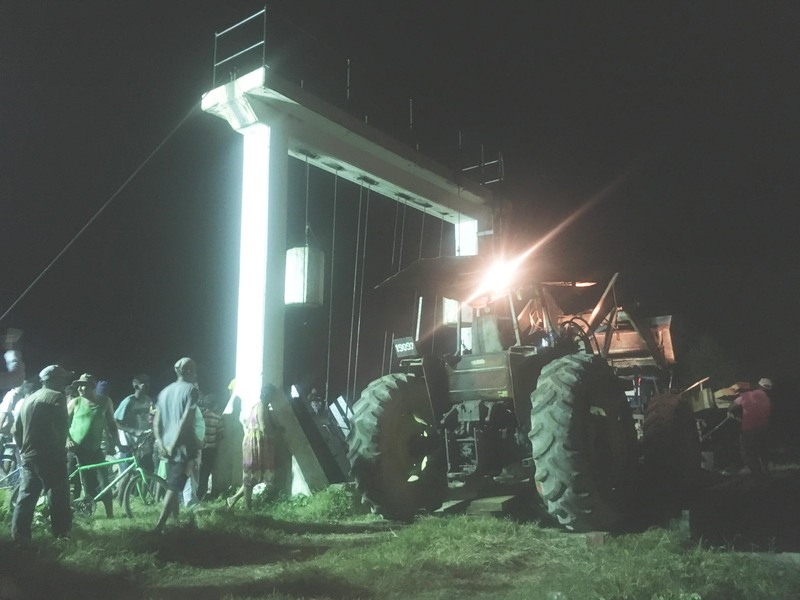 Representatives from the Ministry of Public Infrastructure’s River and Sea Defence Department and the Regional Democratic Council, along with other engineers were working at full steam to rectify the situation. Up to press time last night, the false door was still under construction.